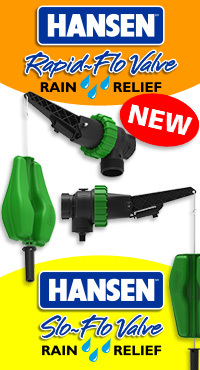 New to the Hansen range of Valves, the Hansen Rapid~Flo & Slo~Flo Valves are designed to supplement your rainwater tank in dry spells from an alternative water source such as mains water supply or water bore. However, the Rain Relief Valves will only fill your tank either 50mm or 100mm. 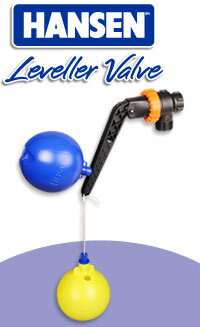 Available as either full Rapid flow or restricted Slo flow to suit your application. The Hanse Mini Fast~Flo Valve is an ultra compact high performance valve that's perfectly suited to very tight fitting environments such as small bowls. 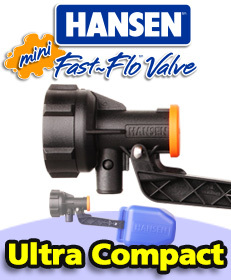 It boasts similar features to the Fast~Flo valve such as the barbed outlet that provides the ability to attach a diffuser hose to reduce water turbulence and features the Hansen "Ezi Clamp" arm to make water level adjustment a breeze. 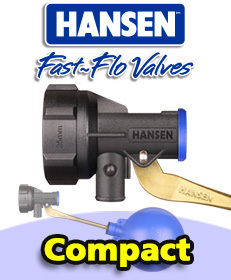 The Hansen Fast~Flo valve is ideally suited to tight fitting environments that demand a more compact sized valve. With responsive on/off capabilities, the Fast~Flo valve brings with it exceptional flow rates and adaptability, making it suitable for dry stock applications as well. Built to the same quality and precision specifications as the Hansen range of valves that precede it, the barbed outlet allows for a hose attachment to both diffuse and help eliminate noise from the outlet flow. A tough, reversible urethane seat effectively doubles the life of the valve providing a ‘best of class’ valve that’s reliable for the long term. AVAILABLE NOW at your local rural supply store! 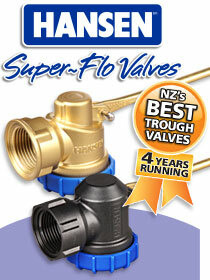 New to the Hansen range of valves is the Hansen Super~Flo valve. Ideally suited to trough valve applications and available in multiple thread and connection combinations, the unique “Slipper Fit Piston” design reduces sticking and increases efficiency, resulting in less operating pressure, reduced pumping costs and increased flows. The mini body design makes it effective for easy installation across a wide range of applications and they have the ability to operate in clean and dirty water applications. 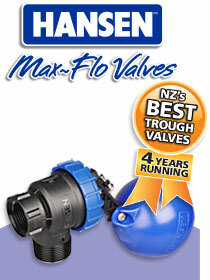 Also new to the Hansen range of Valves is the Hansen Max~Flo valve. Ideally suited to trough and tank valve applications and available in multiple thread and connection combinations, the “Self Cleaning Pilot” ensures the valve is durable and suitable for dirty water applications. Less operating pressure required reduces pumping costs and increase flows. The mini body design makes installation easy across a wide range of applications and they have a 30 year time tested performance slow open and close diaphragm to ensure no undue stress is placed on pump lines or pumps. 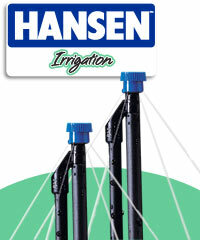 Adding to the Hansen range of Valves is the Hansen Leveller valve, a high performance reservoir/tank valve. Hansen recognises that the pump sits at the heart of most systems. It needs to be protected and preserved so that your system always runs at it’s best! 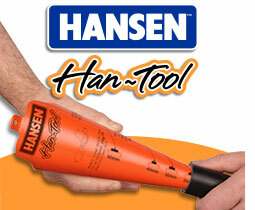 The Hansen Leveller valve does exactly that. It not only protects but extends your pump’s life by reducing it’s workload, saving ongoing maintenance costs and heavily reducing the worry of system failure from an over worked pump. 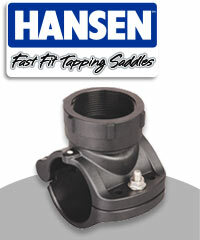 Available for Low Density, Medium Density and Rural B applications, the range of Hansen Fast Fit Tapping Saddles will revolutionise the way you tee off the main pipeline. They have a number of features that make them the saddle of choice such as a Custom Seal that is visible from the outside so you know instantly that the seal is in place, a Pilot Hole for easy installation, a Hinge which also stays connected for fast easy one piece installation and opens past 180° degrees for tight spots, a Spigot to help locate and secure it onto the pipe and best of all only one Stainless Steel M8 bolt which is fixed to the body to avoid lost parts with the same size bolt used on the entire range which means only one tool is required. Put all of this together and you have the solution for a fast, no hassle installation. 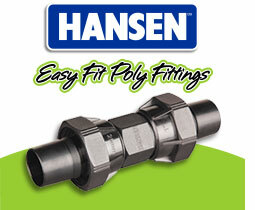 After the success of the Hansen Easy Fit Poly Pipe Fittings, Hansen Products decided to design and manufacture a range of Threaded Pipe Fittings as there was a high demand for non-metallic threaded fittings. 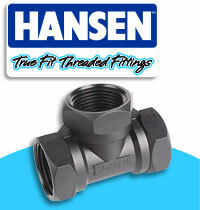 The Hansen range of True Fit Threaded Fittings is one of the largest ranges of durable, high strength, commercial quality Threaded Pipe Fittings in the Southern Hemisphere with over 250 products in the range. Hansen True Fit Threaded Fittings are suitable for use above or below ground, in varying operating pressures and temperatures. They are Strong, Lightweight and Compact and are available in a variety of thread combinations and connections. 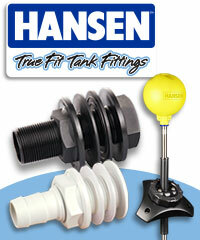 Hansen True Fit Tank Fittings are a high quality fitting designed for use in tanks, troughs and a wide variety of marine applications. All materials are approved for use with potable (drinkable) water and are also fully resistant to salt water making them ideally suited to a broad range of rural, domestic and marine applications. 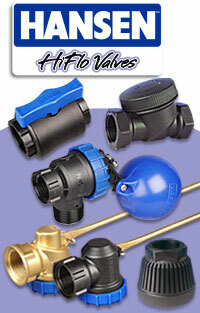 The Hansen valve range incorporates the Ball Valves, Check Valves, Foot Valves, Trough and Tank valves. Manufactured to the same high quality and principals as the rest of the Hansen range, these valves display exceptional flow characteristics and would be a welcome addition to any system looking to incorporate them. 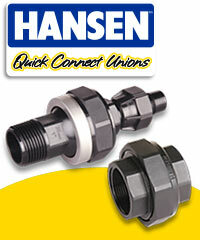 The Hansen Quick Connect Union range was added in the late 1990’s and is designed and manufactured to the same high quality and principals as the rest of the Hansen range.The Hansen Quick Connect Union range makes removing or installing a pump from your system a breeze as all you have to do is undo the common nut. 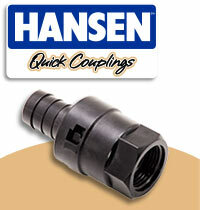 The Hansen Quick Coupling range was added in the late 1990’s and is designed and manufactured to the same high quality and principals as the rest of the Hansen range. 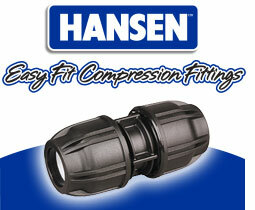 Manufactured for use with New Zealand Low Density Polyethylene Pipe, the Hansen Quick Couplings are suitable for many types of fluid and fits easily onto Hansen Easy Fit pipe Fittings and True Fit Threaded Fittings.